Finnish author Pekka Hiltunen sets his thrillers in London. 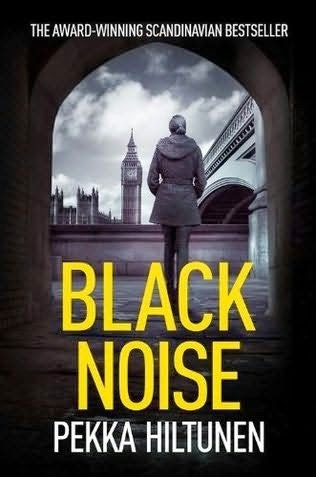 Black Noise is the second instalment in the Studio series which is an intelligent crime thriller pitting unlikely heroines against London's dark crime underworld ultra-violent videos of murder and torture are being uploaded to the internet. When bodies start showing up on the streets of London, it begins to seem that the videos may be real and that a gruesome, exhibitionist killer is on the loose. The news catches the attention of Mari and Lia. Mari and Lia are two Finnish women living in London. Despite bonding over their shared expat identity, they have rather different backgrounds. While Lia is a graphic designer, Mari runs the mysterious "Studio," a private crime fighting organization that considers itself above the law. Taking matters into their own hands, they take on cases where the police have failed or are indifferent. Lia has slowly found her place in among this mysterious, morally motivated group of people who are not above employing underhand tactics to make sure that justice is served. Backed by high-tech gadgets and their team of fiercely loyal experts, the two women set about trying to stem the recent surge of violence and track down the murderer. But the stakes are high and Mari will have to risk much, even the lives of her companions, if she is to bring the perpetrator to justice. Interested in reading Black Noise? There are two copies of Black Noise and Cold Courage (the first book in the series) up for grabs! To get your hands on a copy please send your name, email address and postal address to shotscomp@yahoo.co.uk. Don’t forget to put Black Noise Competition in the subject line! Closing date is 30 October 2014. More information about Pekka Hiltunen and his books can be found on his Facebook page.